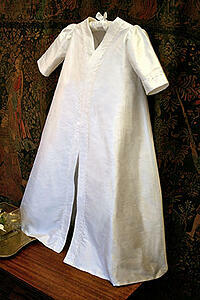 Fashion trends come and go, but few garments have the staying power of the christening gown. 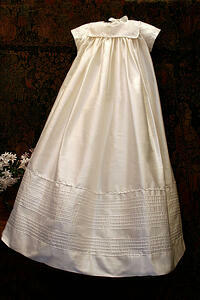 That’s what we love about designing these beautiful gowns. 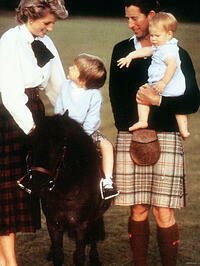 They represent a family’s heritage and tie generations of families together like no other garment in history. 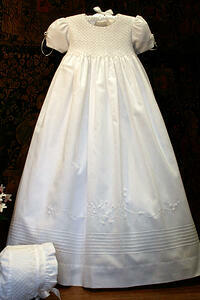 A fascinating example of this time-honored tradition is the British Royal Family’s christening gown. It has a storied history that begins with Queen Victoria, who commissioned the gown for the christening of her daughter, Victoria, in 1841. 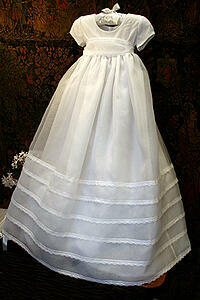 It was styled after the Queen’s wedding dress and has been worn by 62 royal babies over the course of 163 years. That’s truly amazing and is just as it should be. 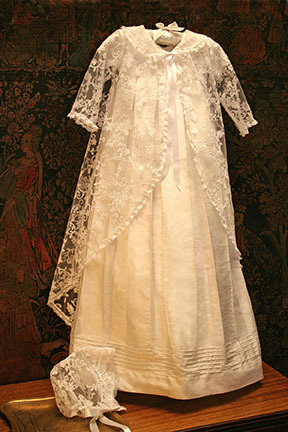 Queen Victoria described the precious gown in her diary as ‘a white Honiton point lace robe and mantle over white satin.’ The Christening gown reads like a history book, but its style has stood the test of time and is just as relevant today as it was nearly two centuries ago. 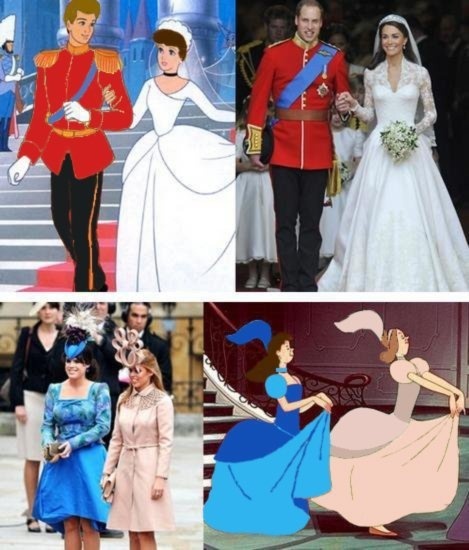 Of course, even these barely worn gowns cannot last forever. 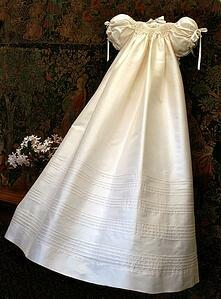 The original 1841 gown was officially retired in 2004, but Queen Elizabeth had it replicated to a tee, so future royal babies can blissfully carry the tradition forward as if nothing has changed. Prince George wore it in 2013 and we are excited to see the heirloom of all heirlooms appear again this summer for the christening of his royal sibling, who is due to arrive in April. 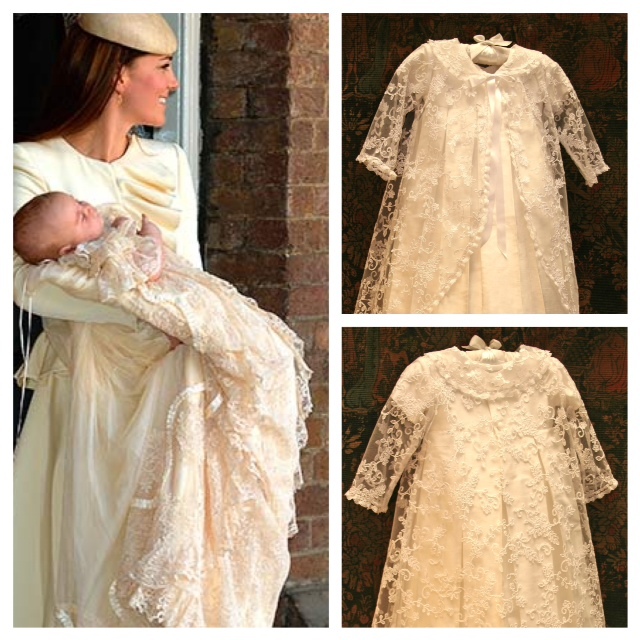 For those of you who want your baby to be christened in a gown similar to Kate and William’s, try Isabel Garretón’s lace and cotton batiste Renaissance Gown. Other styles we love are made of the finest fabrics and are just as lavishly appointed with intricate hand-embroidered details, hand smocking, collar treatments, monogramming and more. While christening gowns are meant to be worn by girls and boys, we also have a selection of boys’ rompers, a style that came into vogue in the 1920s and is growing in popularity today. Accessories, such as booties and monogrammed bonnets, blankets and bibs, sweaters and coats, feature the same exquisite fabrics and embellishments as the gowns and rompers and are irresistible finishing touches. The best part is, Isabel Garretón handmade dresses are part of a social enterprise to give underprivileged artisans in Chile dignified work opportunities and the chance for a better life. 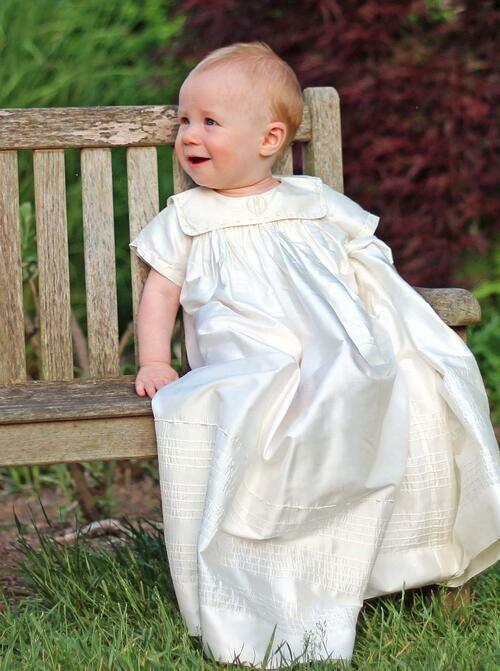 So, every time a baby is christened in one of our gowns, our family tradition of giving back to the world becomes a part of your family’s tradition. 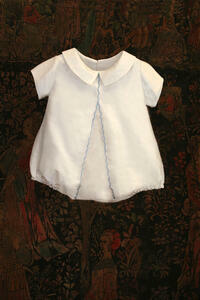 Christening? Baptism? Blessing?...What to wear when it’s a boy. 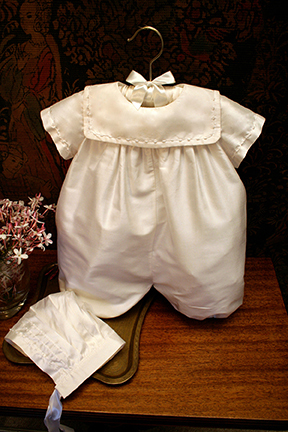 After 25 years offering gowns, rompers, and accessories used in many, many Christenings, Baptisms, and Blessings, we know that to use a gown for a boy’s christening is a frequent debate close to the heart of many families. 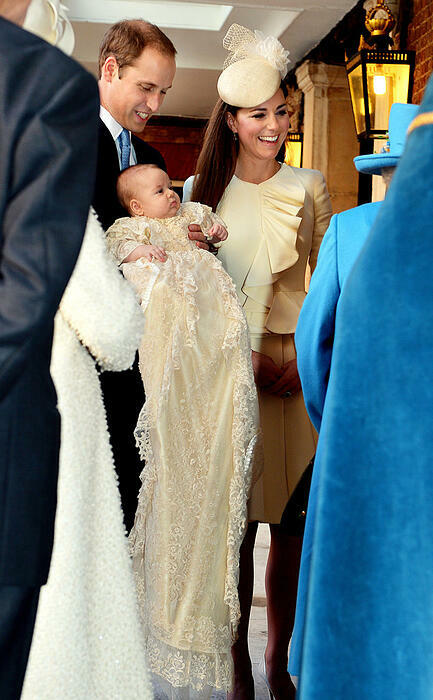 If you are a boy and not Prince George, what to wear for your christening can be a family kerfuffle. Mom’s are often happy to put their sons in a gown, perhaps not as elaborate as the one Prince William and Kate Middleton’s baby wore selected by the force of many years of tradition, but a gown for a boy is preferred by many moms. They endure the dads concern that it is too feminine. While for some dads the disapproval is serious, others cave in by the weight of family traditions or love for their wives. Some dads, who may have been in a gown themselves and are no longer concern with gender ID, are more confortable with this tradition and more likely to use the same gown for a girl or a boy in their family. It becomes an heirloom, a family treasure for years to come. For this reason the fabric, the design, the craft, and finishing touches in every piece matters. For other dads and some moms the preferred choices are rompers for boys, the style depending where in the world they live, what time of the year the event takes place, and how formal they want the ceremony to be. 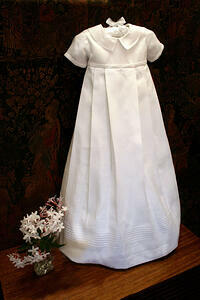 Not only are Christenings, Baptisms and Blessings a religious ceremony, they are also important family traditions. We often do monogramming of the family initials either on the garment or baby’s name and date of the event on the slip, where other new members of the family will add their name and event date. Can be a siblings or a different generation. 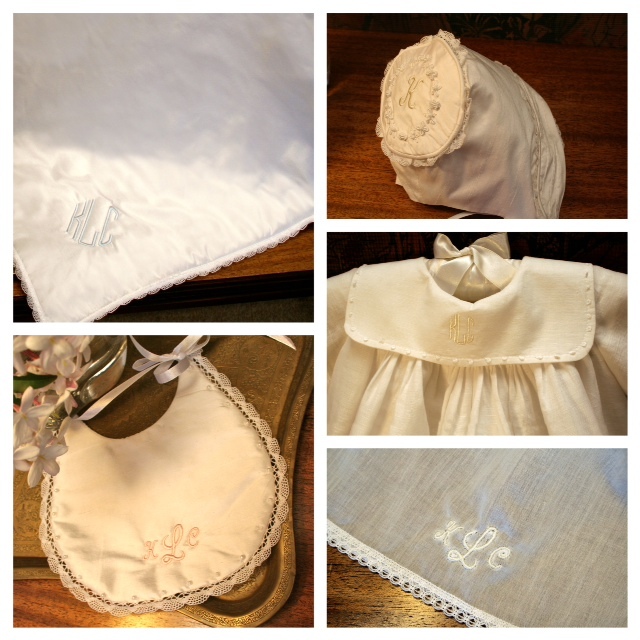 Some families choose to have the baby’s initials in a special blanket, bib or bonnet the baby wore. How was the choice made in your family? Find below from Wikipedia some truly interesting information regarding the content and meaning of the ceremony itself, who practices it, how the meaning changes depending on the denomination and more. Baptism (from the Greek noun βάπτισμα baptisma; see below) is a Christian rite of admission and adoption, almost invariably with the use of water, into the Christian Church generally and also a particular church tradition. In some traditions, baptism is also called christening, but for others the word "christening" is reserved for the baptism of infants. Most Christians belong to denominations that practice infant baptism. Denominational families that practice infant baptism include Catholics, Eastern and Oriental Orthodox, Anglicans, Lutherans, Presbyterians, Methodists, some Nazarenes the United Church of Christ (UCC), Moravian Church, Metropolitan Community Church, Wesleyans, Episcopalians, and the Reformed churches. 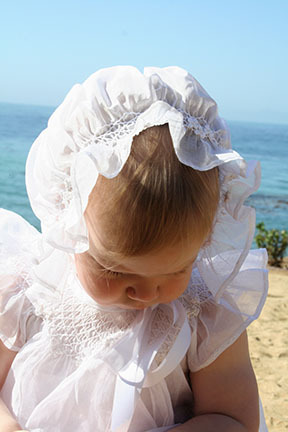 The exact details of the baptismal ceremony vary among Christian denominationsthe belief is that infant baptism has spiritual value for the infant, defined differently by each denomination. Some believing it is as a way to incorporate newborn babies into the secular community as well as inducting them into the Christian faith. It is common for this blessing to be an occasion for family members to gather. 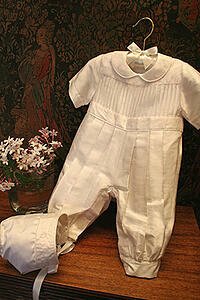 In some families, it is also traditional for the baby or older child to be dressed in white clothing similar to a christening gown, but this is not required. Looking for options for your Baby's Special Day? 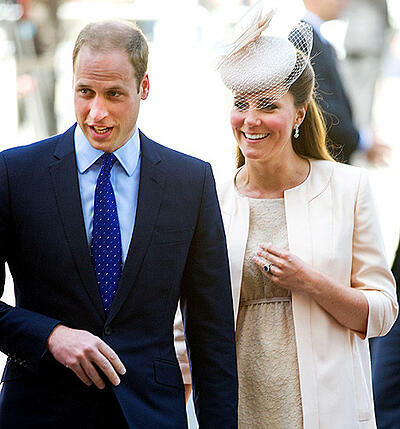 We have been wondering what the frenzy around Prince William and Kate Middleton’s baby says about all of us? Even when my only connection to tabloids are the titles I read while in line at the supermarket, I felt a sort of a happy anticipation when I heard on the news that “The Duchess of Cambridge was in hospital due to deliver who would become the 3rd in line to the British Throne.” Mind you, I have no particular interest in British Royalty, my husband on the other hand seems to know a lot about them. So, I figured there must be some universal reasons why the world press is parked outside a hospital in London. 1.Fairytales, We all grew up with them. A handsome prince and his beautiful princess fall in love, marry and lived h….we know how it ends. Does someone come to mind? 2.A Newborn, No matter how cynical one may become, a baby touches whatever hope we have for the planet to be a good place. 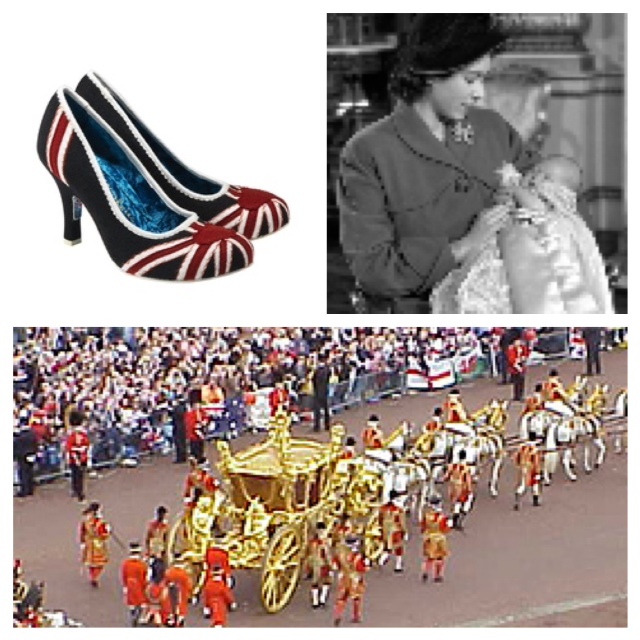 3.Familiarity, Unlike other royal families, the British Royal Family has afforded us through the years a glimpse into grand events …and the joy and sorrows at the heart of all families. A newborn guaranties many stories to come. 4.Tragedy, Diana’s untimely death, brought empathy from the world to her boys and we feel good when they seem to achieve adulthood being nice, responsible and are happy. This birth is certainly one of those moments. 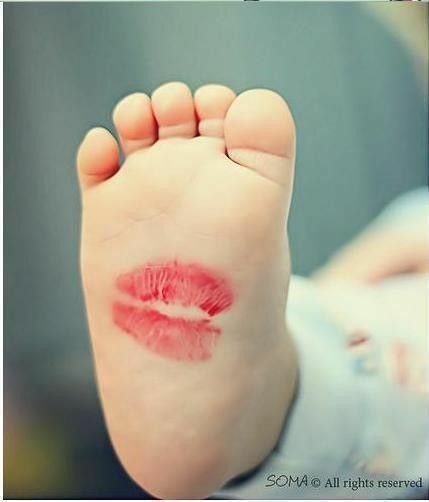 5.Happiness, When the news informs us daily of a violent, dangerous and fragile world, A newborn brings the illusion of a fairytale, the closeness of familiar, the possibility to overcome tragedy and the happiness that springs from hope. I think this little prince, not a week old, has already given many of us at least a smile. Thank you, and welcome to the world. May we suggest something for your wardrobe?